COLORADO SPRINGS, CO – Colorado is a national conservation leader. Behind every effort to protect and conserve our incredible state is an individual or organization dedicated to maintaining our state’s quality of life through land conservation. Each year, Palmer Land Trust’s Southern Colorado Conservation Awards (SCCA) honors the efforts made across our region by acknowledging the people and the partnerships that have had a significant impact on southern Colorado through their efforts. SCCA has recognized and honored the people conserving Colorado’s iconic character for nine years. Past award winners and their stories can be found on the Palmer website and the Palmer YouTube channel. The Stuart P. Dodge Award honors a lifetime achievement in conservation. Sydney Macy has left an indelible mark on Colorado and the west over the course of her career. She has completed well over 100 individual conservation transactions and has helped preserve hundreds of thousands of acres across the state. To highlight a few of her many accomplishments: Sydney served as the Colorado State Director for The Nature Conservancy and the Director of The Conservation Fund, played an instrumental part in protecting Mueller State Park, and provided the vision behind the preservation of the I-25 corridor between Castle Rock and Monument. Her dedication and no-nonsense approach to conservation have propelled her. Her achievements more than grant her due recognition for a lifetime of achievement in conservation. The Environmental Stewardship Award recognizes an individual or organization that has positively impacted the land and the way members of our communities understand and respect their relationship with the land. Loretta McEllhiney is the woman behind the National Forest Foundation’s “Find your Fourteener” program. She has helped spearhead the stewardship of Colorado’s 14ers by working with partners to balance fragile alpine tundra and critical natural resources with one of the state’s top recreational pursuits. She is the epitome of sustainable outdoor recreation. As the only Fourteener Program Manager for the U.S. Forest Service, Loretta’s work affects every single hiker and recreationist who ventures out to enjoy Colorado’s fourteeners and the backcountry they provide. The Innovation in Conservation Award honors an individual, group, project, or program that has advanced the cause of conservation by developing new conservation models, creating new conservation funding mechanisms, or implementing unique partnerships that protect our natural heritage. Water is the lifeblood of communities in the San Luis Valley – culturally, economically, and ecologically. With water rights in the Culebra watershed at extreme risk of transfer off properties, the Sangre de Cristo Acequia Association and Colorado Open Lands partnered to facilitate programs that support irrigators and provide resources so communities can be empowered to make decisions about their water future. This innovative and community-oriented approach to conservation has made it possible for farmers in the San Luis Valley to navigate the challenging water future they face. The Inspired Future Award celebrates an individual, program, business, or organization that is undertaking an activity or effort that boldly frames the future of conservation, exhibits gumption and grit in the face of challenges, and encourages others with the resilience and optimism it will take to advance conservation. Our country is seeing unprecedented challenges to family farms, and still, America’s farmers are pillars of our communities and vital to local economies. Sarah Hamilton and Ellen Kerchner have embraced the farm life. Their sacrifice, hard work, and love for the land is leading them to produce good food for local people using growing practices that support a diverse and healthy farm. They use natural systems and hand tools, and work to give more back to the soil than what was taken. Their stewardship ethic will build healthier soil and healthy communities while bringing agriculture into the future. 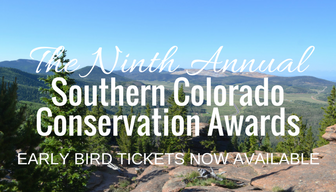 SCCA is the premier awards event for conservation in southern Colorado. Since the first award ceremony was held in 2009, this event has brought attention to the hard work, the discipline, the sacrifice, and the impact of conservation work by recognizing the efforts of individuals and organizations who prioritize the identity, economy, and quality of life we expect in Colorado. Over the course of nine years, community and state-level leaders, non-profits, and national organizations have attended to honor the people who press Colorado forward by working to maintain our landscape, our biodiversity, and our farming and ranching communities. Those recognized ensure every generation has the opportunity to enjoy the Colorado we know and love. 2019 SCCA Winners Have Been Announced!